I see your quizzical brow. But, please, hear me out. This Anglophile was over the moon to attend a special premiere screening of “The Death Of Stalin” at the gloriously ornate Theatre at Ace Hotel last night where a live orchestra performed the Christopher Willis film score. Writer and director Armando Iannucci, a native of Glasgow, whose name you may recognize from Knowing Me Knowing You with Alan Partridge, The Thick Of It, In The Loop and Veep, introduced the film, reminding us more than once that although the subject matter is bleak, the film’s title contained both the words “death” and “Stalin” and was set in 1953 Moscow, it was, indeed, a comedy. Iannucci based the script on the graphic novel of the same name. British stars Rupert Friend, Jason Isaacs and Andrea Riseborough also attended along with American actor Steve Buscemi. They didn’t look entirely comfortable and, I’m guessing, were waiting to see how the film was received by the crowd. They needn’t have worried. This film is dry, dark, intelligently twisted British humour at it’s finest. Rapid, clever zingers are both fired off and thrown away so steadily that I missed quite a few to the laughter. While I was watching, I knew I’d have to see this film again not only to hear the dialogue which had gotten drowned out, but also after I’d looking up some of these historical characters up because I’m sure to have missed some comic subtleties which might be better appreciated after a little reading. The politics and plotting sweep one along and, though complex at times, the story is never confusing. The film takes us behind the scenes as Soviet committee members wrangle for power after the sudden demise of Josef Stalin. Drop the notion right now that this is one of those movies where you easily identify and root for the good guys. There aren’t any. But the film entices you to follow the story down a dark, tyrannical tunnel, laughing —almost– all the way. Every character is singularly well defined. Nothing is sacred, particularly not the power over life and death. The acting is just plain brilliant. I cannot heap enough praise on this cast. Anglophiles will see many familiar faces. Adrian McLaughlin as Stalin switches from jovial to terrifying in a nanosecond. We cheer when he keels over. Simon Russell Beale plays Lavrenti Beria, a name not nearly as familiar as fellow committee members, yet his will be the character you remember as the credits roll. Beale’s portrayal fills every evil, sadistic, absurd corner of Beria’s being and still makes us laugh. Michael Palin plays Molotov (yes, THAT Molotov) as a bumbling man you nearly pity. Pity! Molotov! Americans Jeffrey Tambour as Malenkov and Steve Buscemi as Khruschev blend hilariously and seamlessly with the British cast. Jason Isaacs and Rupert Friend, both in military regalia, send the comedy way over the top just when we need it. Andrea Riseborough is frentic and fragile as neurotic Svetlana Stalin, daughter of the departed. Early scenes with Paddy Considine and Tom Brooke at a concert hall set the tone and take the fear of life and the threat of death under Stalin to panicked comedic heights. Near the end of the film there is an abrupt shift in tone and we follow these political consequences to their natural conclusion. We end the film back in the concert hall with a bit of smirk and historical wrap up. What a ride! This film leaves one not just remembering the comedy, but makes one think, without pointing fingers at any particular regime, as it draws parallels to our twenty first century reality and leaves one wondering if, as the saying goes, the inmates really might be in charge of the asylum. It was a particular treat to see this film in a classic “movie palace” and the perfectly synced live orchestra was transcendent. Live music brought an immediacy to the events of the film. The standing ovation at the end was for the whole experience and was —unanimous. You’ll get that reference after you see the film! Even without the live orchestra, this score will take you places…murky, disquieting and hysterically funny places. Go! 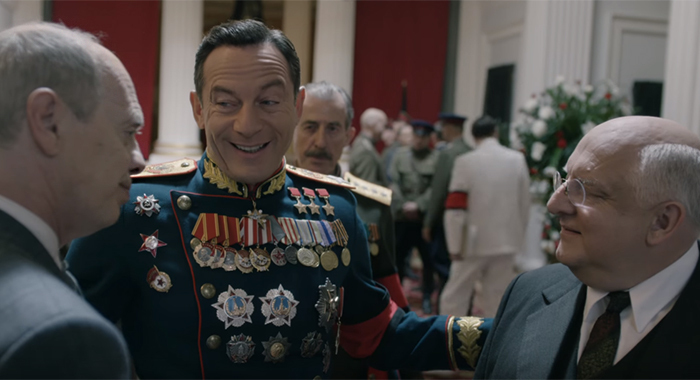 This entry was posted in Bats In My Bonnet By Lady Elyse Ashton, Home Page Posts, MOVIE REVIEWS and tagged #MichaelPalin, #TheDeathOfStalin #ArmandoIannucci #JasonIsaacs #BritishComedy #RupertFriend #SImonRussellBeale #MaichaelPalin #SteveBuscemi #AndreaRiseborough #AdrianMcLoughlin #JeffreyTambour #Stalin #Russia. Bookmark the permalink.